GTS folk at the Consecration of the Diocese of Maryland’s new Bishop Suffragan (L to R): Bruce Parker ’84, Anna Noon ’10, Nick Szobota ’05, Annette Chappell ’03, Bp. Cook, Jesse Parker ’81, Barry Signorelli ’87, Mark Hansen ’85. 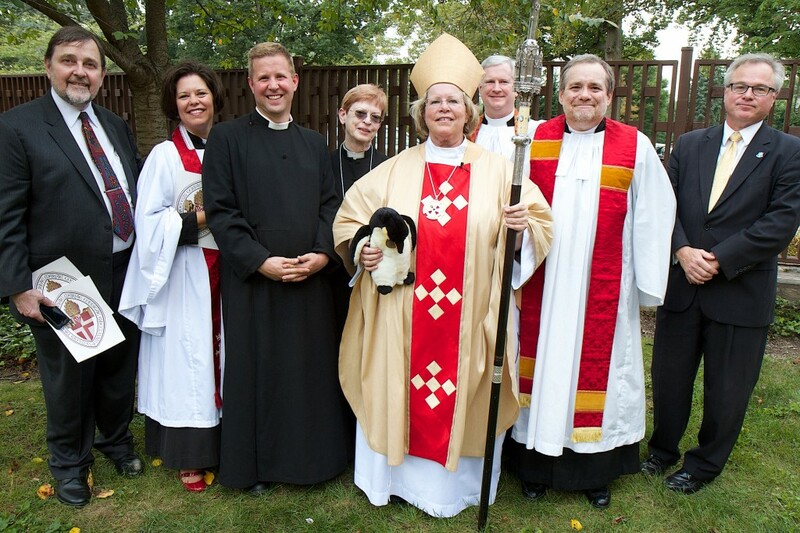 On September 6, 2014 Heather Elizabeth Cook (Class of 1987) was consecrated bishop in The Episcopal Church and made Bishop Suffragan of the Diocese of Maryland at a service at the Church of the Redeemer in Baltimore. She is the first woman bishop in the diocese. The service featured participants from across the diocese, including Cook’s family, friends, people from past ministries, as well as a contingent of representatives from General Seminary: Anna Noon (’10) and Jesse Parker (’81) were litanists, Bruce Parker (’84) was a lector, Mark Hansen (’85) and Barry Signorelli (’87) were among the presenters of gifts, Nick Szobota (’05) was Master of Ceremonies, and Annette Chappell (’03) chaired the Consecration Planning Team. Music included singing General Seminary (“King of glory, king of peace”) and a Dr. David Hurd setting of the Sanctus (from New Plainsong). Presiding Bishop Katharine Jefferts Schori served as the chief consecrator. To honor her early years in Baltimore and her Episcopal education, a student from St. Paul’s School for Girls, Brooklandville, Maryland, where Cook graduated in 1974, led the opening procession with the school’s flag. Following the service, Cook offered blessings at the altar of the church. Since ordination to the priesthood on April 30, 1988, Cook has served as a boarding school chaplain at Stuart Hall in Staunton, Virginia; assistant rector at St. Matthew’s Episcopal Church, Bedford, New York; rector of St. Andrew’s Episcopal Church, York, Pennsylvania; canon for mission in the Diocese of Central New York; and canon to the ordinary in the Diocese of Easton on the Eastern Shore of Maryland. Cook was elected Bishop Suffragan for the Episcopal Diocese of Maryland on May 2, 2014. She serves as the first woman bishop in the diocese, succeeding the Rt. Rev. John L. Rabb who retired in 2010, and the Rt. Rev. Joe Goodwin Burnett, who served as Assistant Bishop 2010-2013. The ceremony can be viewed on line at www.episcopalmaryland.org/consecration-live-stream.